If you have water problems in your basement or crawl space, you could be wasting valuable space in your home. Your wet basement or crawl space could also be causing other issues in your home that you might not have noticed, like mold or structural damage. One of the easiest and most cost-effective ways to put an end to flooding or wetness below the home is by installing a sump pump. What is a sump pump and who can install one? A sump pump keeps the basement dry by relieving water pressure. Drain pipe installed inside the basement along the edge of the floor collects water and carries it to a sump pit. The sump pump comes on automatically when water in the sump pit reaches a certain level, pumping the water outside the house through a discharge line. Plumbers, basement waterproofing specialists (like Basement Systems contractors) and even DIYers can install sump pumps, although it takes specialized equipment and experience to install a complete sump pump system like the ones designed by Basement Systems. Choosing the best sump pump for your needs is just as important as making sure it is installed properly. If your basement doesn’t have a perimeter drain or sump pit, this is the typical process you can expect during the installation of your sump pump system. The installation method is similar for a crawl space. Jackhammer a perimeter drainage channel and sump pit. The best way to relieve the hydrostatic pressure that causes basement flooding is to “capture” ground water at the juncture where the foundation wall meets the concrete floor and transport this water to your sump pump. 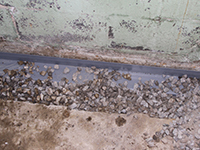 A drainage channel is installed around the edge of the basement floor. A sump pit is then installed below the basement floor level. Install drain pipe. The WaterGuard® drainage system is typically installed. We also offer other drainage systems for different needs. Gravel is placed to surround the drain pipe as it’s placed in the drainage channel. The pipe is sloped downward slightly where it enters the sump pit to promote proper drainage. A durable plastic sump liner is installed in the pit. Install the sump pump. 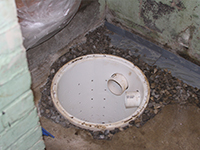 Once the sump liner has been installed, the sump pump is placed inside the liner. Patch the floor. 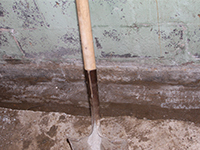 Mortar is used to cover the drain tile along the perimeter of the basement floor. The edge of the sump liner is patched as well. Power up. It’s best for the sump pump to have its own circuit. A GFCI-protected receptacle can be installed on the wall nearest the sump pump. Contact Basement Systems today to schedule an in-home consultation with the sump pump contractor in your area. All Basement Systems sump pumps are installed exclusively by our authorized dealers.